The Reiksguard knights are entrusted with the sacred duty of the Emperor’s protection from foes within and without. Under the command of Marshal Kurt Helborg, the Reiksguard live and breathe their code of loyalty, courage, strength and honour. But in the midst of a ruinous war, the young knight Delmar von Reinhardt discovers that this most venerated order hides deadly secrets. Battling an unholy alliance of a goblin warlord and an ogre tyrant, Delmar must unearth the truth no matter which noble knight he should find at its heart. It’s not just about the fights though. Williams takes a good long look at the ulterior motives behind the purest of motives and shows us what men must do to survive in troubled times such as these. The plotting, and counter plotting, at court shows us that not all combat is fought using steel (maybe it is though, just a different type of steel...) and is a refreshing source of intrigue that gets you asking all the right questions. The strength of the novel lies in Williams' faultless prose, his understanding of military actions and behavior, the vivid battle scenes, and the well-described world of the goblin invaders. Additionally, the novel presents a certain psychological complexity: the young nobles are purblind, obstinate, ignorant, and petty; the politicians manipulative, cunning, and cruel, and the generals (except for Helborg) foolish and ambitious. The battle scenes are well wrought and explicit. Williams seems to understand the use of his military arsenal and he describes action scenes in a facile, believable way. And finally, the novel moves organically; every action seems to grow out the scene before it, which makes for an enjoyable, seamless read. Its well written, it’s thought provoking but above all its about the unification of a bond of outcasts into one order who will listen to each other or at least have a mutual respect for one another. Good fun, cracking offering which encourages the more uplifting and highly regarded nobleness of mankind. The book is generally well written. I didn't find it tedious or boring, and it moved along at a fair clip. I wouldn't rank it up there with the Time of Legend series, but it is looking like a promising addition to the Fantasy background. Reiksguard really was a mixed bag for me. I enjoyed reading the novel, but certainly found faults in it. The pacing can be all over the place. Some chapters feel like marathon sessions while others feel like cobbled together montages. However, I think Richard Williams gets more right than he gets wrong. The characters of Reinhardt and von Matz are interesting and likeable, and most importantly believable. The action scenes are interesting, though they are not graphic. And the background information and depth given to the Reiksguard as a brotherhood is superb. While not my favorite book, Reiksguard has me interested enough to look for more from the Empire Army series in the future. "Reiksguard is one of my alltime favs because of the characters. There are so many memorable characters in this book it's ridiculous. Obvious standout is the merchant Herr Von Matz, his intelligence, craftiness and understanding of empire politics really gives the reader and inside look at some of the inner workings of the empire." "The novel is fantastically well written and the author, Richard Williams, has created some excellent characters that actually progress meaningfully throughout the novel. The action sequences are very well written and take into account the lack of experience of the main characters that makes it both believable and slightly unpredictable. My main complaint about this book is that the author has created such a good book that I feel it deserves more than a stand-alone novel and has potential to be made into a series in its own right." 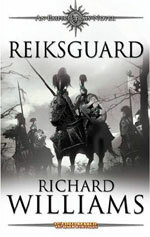 "`Reiksguard' is probably one of the better Warhammer novels that I have read in a while being very well written and easy to read. The characters may be somewhat clichéd but they are generally likable with a couple of stand out characters who are very interesting, such as Herr von Matz." "Cliché, arrogant aristocratic young capital city nobles versus the unsophisticated outsiders of the rural nobles and the highly improbable interactions of this rivalry push a slow plot line. The story picks up as the rescue mission takes off. It just seems as if the plot was lifted from an teen movie of the 1980's, it's only made less believable." "This very well-written book has very good character development and the limited battle scenes are vividly described. I like the emphasis on character and internal conflicts regarding integrity, loyalty, and choosing one's own path over vivid and gory battle details, although there are enough of the latter that those who are looking for them won't be disappointed. The first third of the novel is a bit slow-going, but once readers get past the necessary character background buildup, the remainder of the novel becomes more exciting."